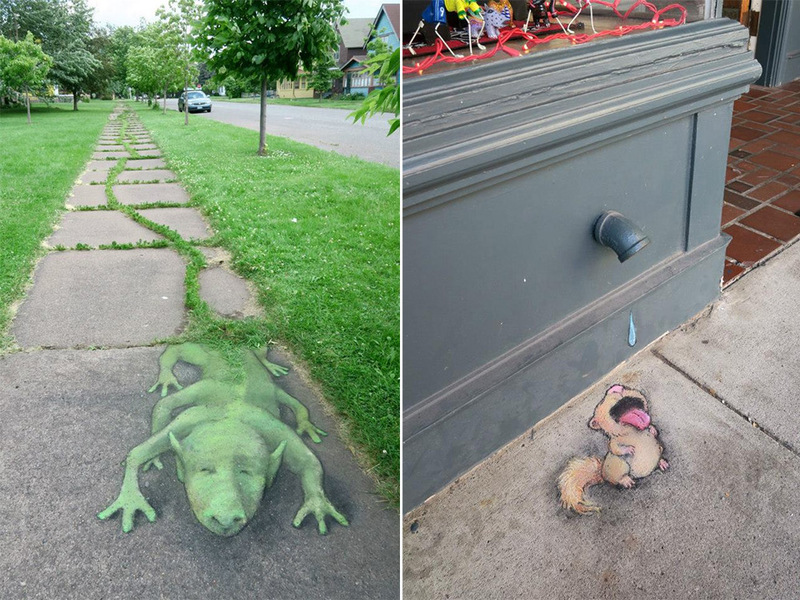 Michigan illustrator David Zinn (previously) has brightened the streets of Ann Arbor with his off-the-wall (or technically on-the-wall) chalk drawings since 1987. The artist works with chalk or charcoal to create site-specific artworks that usually incorporate surrounding features like cracks, street infrastructure, or found objects. Over the years he’s developed a regular cast of recurring characters including a bright green monster named Sluggo and a “phlegmatic flying pig” named Philomena. Many of Zinn’s artworks are available as archival prints, and he recently published a new book titled Temporary Preserves. You can follow his almost daily street chalk adventures on Instagram and Facebook.